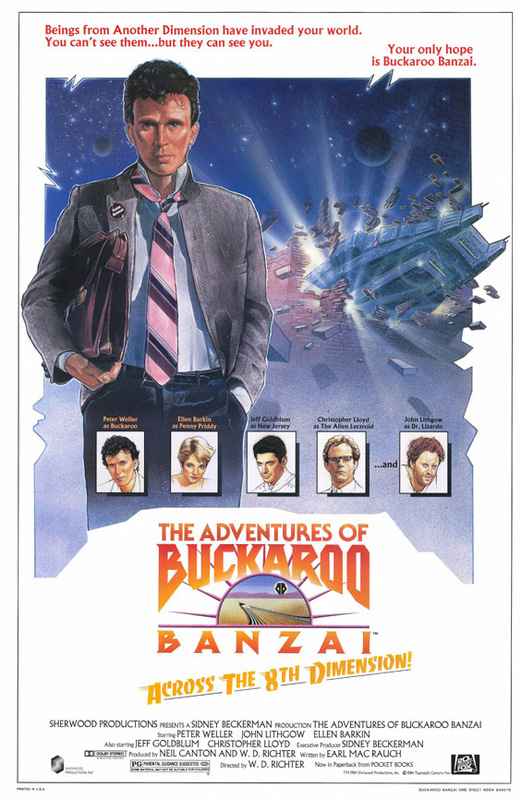 Buckaroo Banzai is a rock-star/brain-surgeon / comic-book-hero/samurai/ etc who along with his group, the Hong Kong Cavaliers, must stop evil creatures from the 8th dimension (all named John) who are trying to conquer our dimension. He is helped by Penny Pretty, who is a dead ringer for his ex-wife, and some good extra-dimensional beings who look and talk like they are from Jamaica. Neurosurgeon/Rock Star/Superhero Buckaroo has perfected the oscillation overthruster, which allows him to travel through solid matter by using the eighth dimension. The Red Lectroids from Planet 10 are after this device for their own evil ends, and it's up to Buckaroo and his band and crime-fighting team The Hong Kong Cavaliers to stop them. If you're looking for a predictable film, do not watch this TAOBBATED, as I will acronymize this film, is neither the stupid low-budget piece of excrement nor the sublimely original cult masterpiece you've been told it is, but it's a lot closer to the latter than to the former.Peter Weller plays Buckaroo, the titular neurosurgeon/inventor/modern-day samurai/Billy Joelesque rocker, and he plays him frightfully well, low-key and distant but with occasional glimmers of genius and intensity.The stellar supporting cast includes Jeff Goldblum, Clancy Brown, John Lithgow, Christopher Lloyd, and Ellen Barkin, and they're all pretty darn good. I'm not even going to pretend to be rational or unbiased about this movie. It's too utterly offbeat and original and just damned _odd_ to not love. Some favorite scenes: the opening sequence of the Jet Car test run, Buckaroo's phone call with the Black Lectroids, and his subsequent detection of the sinister Red Lectroid agents in his midst, the eerie recorded message from the Black Lectroid leader, the "good guys" who threaten to blow up Earth unless Buckaroo stops their enemy, Dr. Lizardo (Lithgow, in a truly twisted scene-chewing performance).Yes, it looks cheesy and dated, but damn it, you have to take a stand somewhere in life, you have to roll up your sleeves and step up to the plate and put yourself on the line, and have the courage to say, "I don't care what anyone thinks of me, I love this movie. "That's the way I feel about old Buckaroo and his Hong Kong Cavaliers, and I still consider myself a loyal Blue Blaze Irregular fifteen years after seeing this film. As a post-script, I'd like to mention that the novelization of this movie, written by Earl Mac Rauch, is great, and actually contains about 3 times the information and plot that is in the movie.If you can find it on Amazon or at a garage sale somewhere, snap it up, it's worth the search.Also, there's a script for BUCKAROO BANZAI VERSUS THE WORLD CRIME LEAGUE floating around too, which should be made no matter the cost if only to film one priceless scene - the cameo appearance of Jack Burton, Kurt Russell's swaggering truck driver hero from John Carpenter's BIG TROUBLE IN LITTLE CHINA, who appears as a Blue Blaze Irregular and gives Team Banzai a lift!